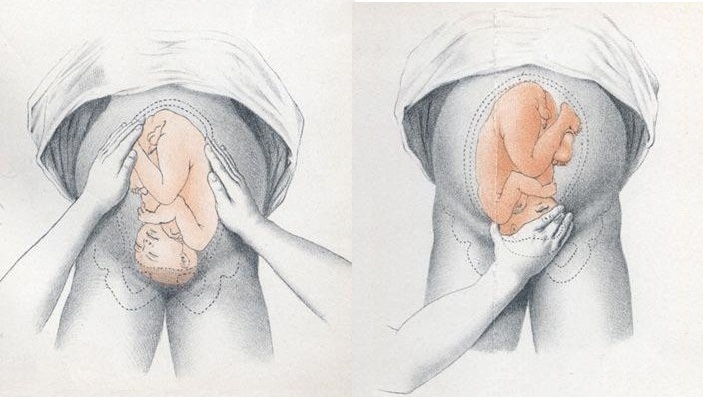 The obstetric examination is a type of abdominal examination performed in pregnancy. It is unique in the fact that the clinician is simultaneously trying to assess the health of two individuals – the mother and the fetus. In this article, we shall look at how to perform an obstetric examination in an OSCE-style setting. General wellbeing – at ease or distressed by physical pain. Hands – palpate the radial pulse. Head and neck – melasma, conjunctival pallor, jaundice, oedema. Legs and feet – calf swelling, oedema and varicose veins. Fig 1 – Skin changes in pregnancy. A) Linea nigra. B) Striae gravidarum and albicans. Ask the patient to comment on any tenderness and observe her facial and verbal responses throughout. Note any guarding. Use the medial edge of the left hand to press down at the xiphisternum, working downwards to locate the fundus. Measure from here to the pubic symphysis in both cm and inches. Turn the measuring tape so that the numbers face the abdomen (to avoid bias in your measurements). Uterus should be palpable after 12 weeks, near the umbilicus at 20 weeks and near the xiphisternum at 36 weeks (these measurements are often slightly different if the woman is tall or short). The distance should be similar to gestational age in weeks (+/- 2 cm). 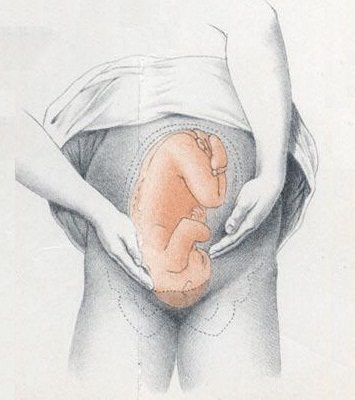 Fig 2 – Assessing fetal lie and presentation. Palpate the lower uterus (below the umbilicus) to find the presenting part. Firm and round signifies cephalic, soft and/or non-round suggests breech. If breech presentation is suspected, the fetal head can be often be palpated in the upper uterus. Ballot head by pushing it gently from one side to the other. Note how much of the head is palpable – if the entire head is palpable, the fetus is unengaged. Fig 3 – Assessing fetal engagement. Locate the back of the fetus to listen for the fetal heart, aim to put your instrument between the fetal scapulae to aim toward the heart. Hand-held Doppler machine >16 weeks (trying before this gestation often leads to anxiety if the heart cannot be auscultated).